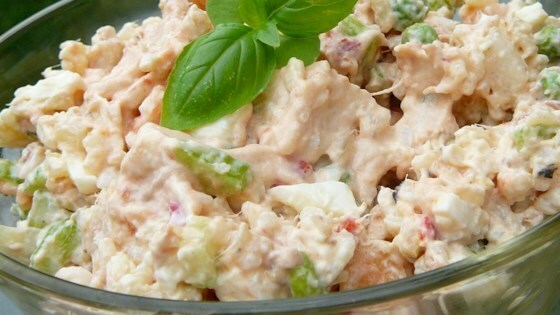 "This rice salad is a great summer salad in place of potato salad, or any time of year!" In a saucepan bring water to a boil. Add rice and stir. Reduce heat, cover and simmer for 20 minutes. Remove from heat, and set aside to cool. Place eggs in a saucepan and cover with cold water. Bring to a boil and immediately remove from heat. Cover and let eggs stand in hot water for 10 to 12 minutes. Remove from hot water, cool, peel and chop. Rinse frozen peas under cold water. Strain, and place in a large mixing bowl. Add eggs, rice, celery, onions, and pimiento; toss to combine, and set aside. In a separate bowl, stir the mayonnaise together with mustard, lemon juice, relish, tuna, dill, salt, and pepper until well blended. Add to the vegetable mixture, and toss to combine. Cover, and refrigerate for a minimum of 4 hours. Toss once more before serving. Serve chilled. This is a great recipe for a carry-in. I substituted bacon for the tuna though. The dill is gives a great flavor! Nice different salad. My husband didn't care for it a whole lot, I liked it but not wow enough for me to make it again. This rice salad goes together quickly and tastes great! Since I didn't have pimentos, I used about 1/3 cup salsa instead and omitted the mustard and relish. Turned out pretty good, not stellar. But who expects stellar from tuna, anyway?